The Catholic Media Coalition, a group of Catholic journalists, writers, and web site hosts, issued a statement today deploring the action taken by 55 self-proclaimed “leading bio-ethicists” who signed an amici curiae brief siding with Michael Schiavo, asking that the Florida Supreme Court rule in favor of doctors removing the feeding tube from Schiavo’s brain-damaged, estranged wife, Teresa Schindler Schiavo. Among the group of ethicists, physicians and theologians are five Roman Catholics, three of whom are affiliated with Jesuit-run Boston College: Rev. John Paris, SJ, the Walsh Professor of Bioethics at Boston College; Charles Baron, a professor at Boston College Law School and a member of the board of directors of the Death with Dignity National Center; Milton Heifetz, author of The Right to Die and a visiting lecturer at Boston College Law School, Lawrence Nelson, associate professor of philosophy at Santa Clara University and faculty scholar at the Jesuit school's Center for Applied Ethics; and James Walter, director of the Bioethics Institute at Loyola Marymount University. Autonomy, an organization that promotes assisted suicide joined the ethicists in the brief. The Holy Father’s statement is the most recent and definitive teaching on euthanasia, one that leaves no room for debate, one which the ethicists and members of the clergy choose to challenge. The Catholic Media Coalition urgently asks that the bishops of the United States publicly defend the Church’s magisterial teaching on euthanasia as set forth by the Holy Father John Paul II from such attacks. We further call on the bishops to publicly support the life of the disabled innocent Catholic woman, Teresa Schindler Schiavo, who, by virtue of the Florida courts, is in imminent danger of dying a prolonged and horrific death by starvation thus serving to advance the cause of legalized euthanasia in our society. 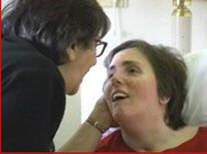 For more information on Terri Schiavo please visit www.catholicmediacoalition.org and www.terrisfight.org .